One of the most sought after creatures in Yellowstone is the Gray Wolf. Although growing in number they are hard to see and even harder to get close enough to photograph. Normally they can only be seen with binoculars or a scope. I got lucky today in the park when I was out helping my parents with another job; found a pack of five wolves all from different packs that left and joined to form this one. 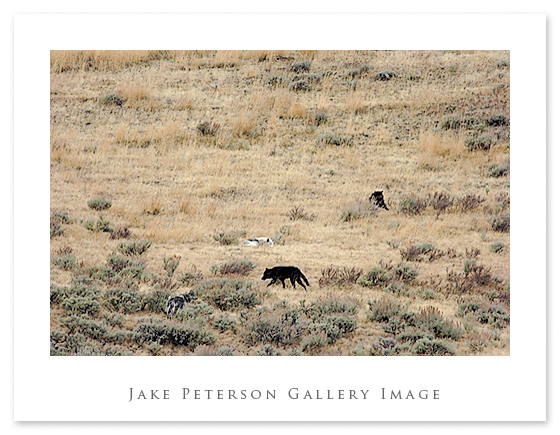 The alpha female is the white one in the middle with the colar, beside her are two black wolves and a grey one, the fifth wolf is up higher on the hill. This definetely isn’t the million dollar shot but it is a start at capturing these marvelous creatures.